Can the forest department save the Great Indian Bustard from extinction? apart from the signboards directing the way to Son Chirya Sanctuary in Ghategaon, it is quite impossible to tell whether your destination has arrived. A railway line goes past the protected area, situated 60 km from the historic town of Gwalior in Madhya Pradesh. There is an irrigation dam, too, and mining activities are in full swing. Once the habitat of the endangered Great Indian Bustard -- popularly known as son chirya -- the sanctuary has been taken over by humans today. The 516-sq-km sanctuary was declared a protected area in 1981 to preserve 25 bustards nesting there. However, only three were reportedly sighted in 1998, although forest officials claim that more have been seen this year. On the one hand, these birds are victims of the conflict between the revenue and forest officials. On the other hand, their habitat is threatened by the conflict between officials and local people from the neighbouring 75 villages. Out of the 75 villages in Ghategaon, the forest department ( fd ) has 35 villages listed in its records, while the revenue department recognises only 24. According to Cheturam of Nayapura village, in 1978, the people of Nayapura were given 100 hectares (ha) of land for cultivation and settlement by the revenue department. However, after the notification of the sanctuary in 1981, they were asked to vacate the land. Revenue department officials say they are trying their best to re-settle these people, but there is a lot of confusion between the revenue and the forest departments. "In 1963, the fd notified the now-disputed 100 ha of land as its property. However, in 1978-79, the revenue department issued pattas (title deeds) to the Saharias," says P R Upadhyay, revenue officer of Ghategaon. Meanwhile, all that the villagers want is their land. "We do not know what is happening. We just want our land back," says Cheturam. This issue has sparked off the Visthapan Roko Andolan (Movement Against Relocation), instituted by social workers of Gwalior and Ghategaon. It has roped in Ekta Parishad, an ngo , into the struggle. "The government, on the one hand, is displacing tribals in the name of conservation and, on the other, it is promoting the construction of dams and railway lines on the periphery and inside the sanctuary," says social activist Rajilal Nadir. Another project is the Gwalior Bypass project. Approved by the ministry of surface transport, the project will soon acquire about 95.095 ha of forestland, a major chunk being that of the sanctuary. Besides, there is a housing plan, Counter-Magnet New Gwalior, to be approved by the ministry of urban development, which, experts say this is going to take up one-third of the sanctuary. The disappearing bustards Ghategaon is not the only Great Indian Bustard sanctuary where the birds are facing extinction. A century ago, the bird population was spread across the entire Indian subcontinent - from Punjab in the north to Tamil Nadu in the south, and from Sind (Pakistan) in the west to Orissa in the east. The bird was, in fact, the symbol of a healthy grassland which is its habitat. Today, it survives in isola-ted pockets in six states - Rajasthan, Madhya Pradesh, Gujarat, Maharashtra, Andhra Pradesh and Karnataka. In the early 80s, these states had declared some areas as bustard sanctuaries. From 1981 to 1988, the Bombay Natural History Society ( bnhs ) conducted detailed studies on the ecology and biology of the Great Indian Bustard at three different sites - Karera Bustard Sanctuary in Shivpuri district of Madhya Pradesh, Nannaj Bustard Area in Solapur district of Maharashtra and Rollapadu Wildlife Sanctuary in Kurnool district of Andhra Pradesh. The bnhs study revealed that the preferred habitat of the bird is dry, short grasslands where the vegetation is less than one meter high. Light grazing by livestock and wild herbivores actually improves their habitat. But over-grazing, which is rampant in India, has a severe impact on its breeding because the egg is frequently destroyed by grazing animals. The greatest beneficiary of grassland protection is the blackbuck ( Antilope cervicapra ), which is another true inhabitant of short grassy plains. Moreover, blackbucks have a tremendous potential to increase in number. But their tendency to destroy crops makes them unpopular among farmers. An important feature of a bustard core area is that it can be a seed bank. Owing to severe overgrazing throughout the year, many grasses used for fodder have disappeared or remain in the form of roots or stolons. If 100-200 ha plots are protected in a mosaic of crop fields, grazing land and fallow fields, they would serve as seed banks to regenerate other grasslands. The fd , however, still carries on with its old policy of excluding the local people from conservation activities. 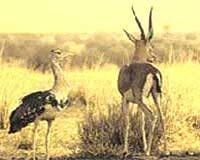 Karera Bustard Sanctuary in Madhya Pradesh is a classic example of mismanagement. This 202 sq km sanctuary was established in 1981 amid 22 villages. At that time, there were around 14 bustards. Most of the time, the bird was found in remote, arid, uncultivable rocky land so there was no conflict. And the small population of blackbucks did not pose any major threat to the crops. By 1986-87, the bustard population was not increasing. However, the fd claimed that in 1989 there were 40 bustards in the sanctuary. By 1994, the last bustard had disappeared from Karera, but the fd kept claiming that there were at least 16 birds. It was only when for two years not a single bustard was sighted, that they relented, but blamed the villagers for the disappearance. Control of the blackbuck population would have been an important step towards pacifying the irate locals. Villagers were against bustard conser-vation in view of the damage done to their crops by the blackbucks. Today, the blackbuck survives in Karera but the Great Indian Bustard has paid a heavy price for the fd 's follies. Unless the problem of blackbuck damage is tackled effectively, the story of Karera will be repeated in other sanctuaries like Rollapadu and Nannaj.